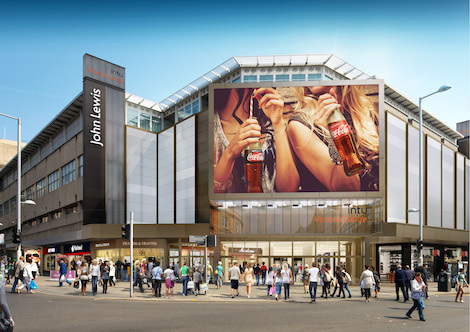 Shopping centre owner intu has teamed up with premium out of home media owner Ocean Outdoor to launch Nottingham’s first large format digital advertising screen that will engage shoppers with content tailored to their consumer profile. intu and Ocean Outdoor’s partnership expands Ocean’s footprint to 10 cities across the UK and support intu’s strategy to deliver compelling experiences across its portfolio of the UK’s most popular shopping and leisure destinations. The Nottingham One screen at the entrance to intu Victoria Centre will use audience recognition cameras to identify someone’s age, gender and even their emotions so that it can display the adverts most likely to entertain them. Richard Malton, Ocean marketing director told us “Nottingham is the UK’s seventh biggest retail centre so our partnership with intu to launch Nottingham One gives Ocean a premium digital out of home presence in all top seven UK cities. Measuring at 11.52m wide by 7.68m high, around the height of a two storey building, the new screen will be the largest in the east midlands region. It’s a 10mmm Lighthouse LED. This entry was posted on Wednesday, June 21st, 2017 at 01:44 @114 and is filed under DailyDOOH Update. You can follow any responses to this entry through the RSS 2.0 feed. You can leave a response, or trackback from your own site.